Follow Husson Eagles on Twitter at @HussonUEagles for the Latest on the Schedule. 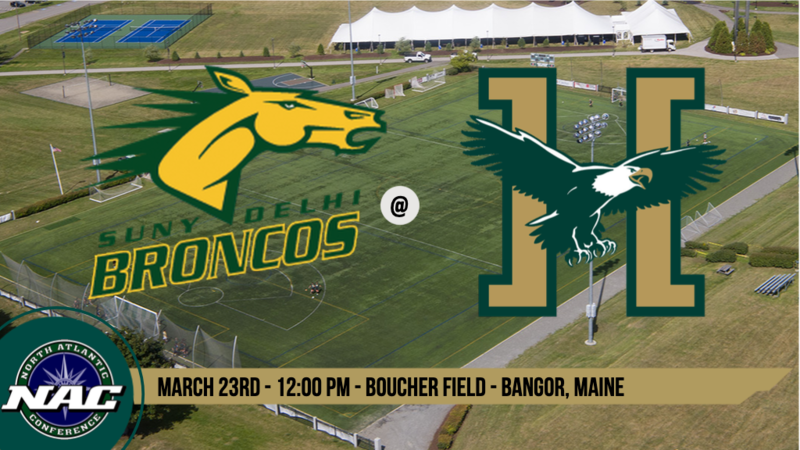 Husson Men’s Lacrosse finishes their three-game homestead with a North Atlantic Conference showdown versus SUNY Delhi at 12 p.m. on Saturday. The Eagles are coming off one of their best weeks in program history after beating Southern Maine, 14-13, in overtime followed by a 23-1 victory over Northern Vermont-Johnson in less than 24 hours. Zach Glazier scored four goals including the game-winning goal versus the Huskies followed by a seven-goal performance versus the Badgers including his 100th career goal. The 11 goals plus two goals versus Colby helped Glazier earn NAC Player of the Week over the past week. Head coach Mike Craig became the winningest coach in program history thanks to the two victories over USM and NVU-Johnson. The celebrating is over for the Eagles as the Broncos come to town. The Broncos are 5-2 on the season and winners of their last five after being picked to finish 6th out of seven teams in the NAC while the Eagles were picked to win the NAC. Freshman goalie Travis Anderson has been a weekly award winner in the NAC since the beginning of the season as he has been named a Rookie of the Week and a 2-time Defensive Player of the Week. It will be the first time in Husson University history that they have played SUNY Delhi in any sport. As of this academic year, the Broncos were in the first of the four-year transition to becoming a full-time Division III school as the Broncos will join the NAC fully, next season. Looking at common opponents is a little hard this early in the season because of SUNY Delhi being located in New York. The SUNY schools (Delhi and Canton) tend to play similar non-conference opponents while the rest of the conference plays similar non-conference opponents. So far, the Eagles and the Broncos haven’t played a similar opponent. I would suggest looking at last season for somewhat of an indication but the Broncos have already increased from their 4-10 record from last season. Should be a good one to watch at Boucher Field!